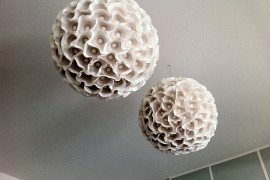 Cupcakes have inspired an innumerous quantity of designs. 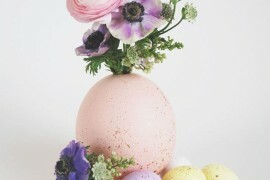 Their sweet side combined with an endless design possibility make them perfect as desert, as well as decorative objects. 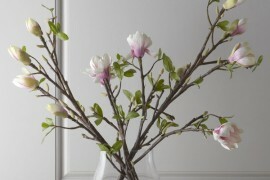 In an inspiring food-related home decor world, the cupcake is just making its presence noticed. I’ve seen nail art with cute little cupcakes and immorally delicious cupcake tattoos; now it’s time to go beyond our skin and enjoy cupcakes in our homes. 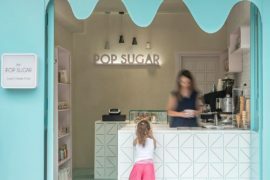 From cupcake wall art to cupcake pillows, this interesting theme sweetens up children’s rooms or it can become just a solitary reminder of the good things in life. Take as example the CUPCAKE Seating Collection by Carolin Fieber for Bretz – a unique, contemporary representation of youthfulness and comfort. Reinterpreting the idea of a fluffy cupcake, the three components of the collection – sofa, armchair, and stool – compose an elegant atmosphere reminiscent of warm dough overflowing from the oven tray. 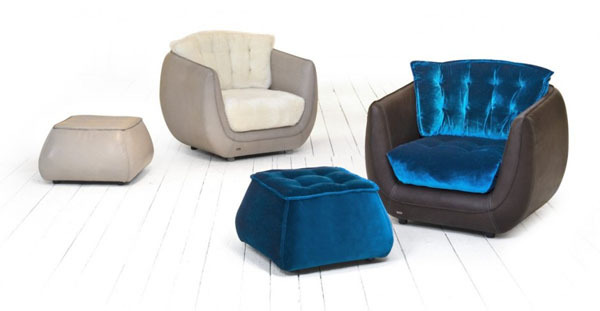 With a hard exterior and soft core, each of the pieces in the collection display an inviting design that promises a fluffy seating experience. 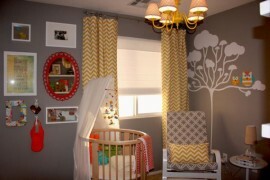 Little princesses are probably the ones benefiting most from this eye-candy design. A girl’s bedroom showcasing pink happiness would definitely look good if adorned with cupcake-inspired decorations. Going even further with the boldness to create cupcake-inspired furniture, some designers combine classy chairs with an undoubtedly fun pattern of colorful cupcakes. 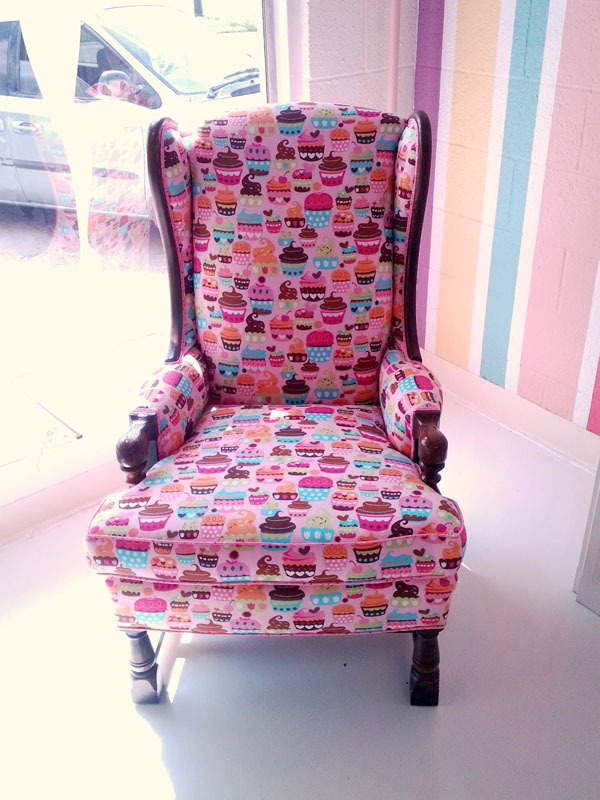 Seen on The Java Mama, this cupcake armchair seems to be a hybrid between a comfortable armchair design and the lovely boldness brought by the repetitive cupcake pattern – a modern piece of furniture not meant for those who ignore the playful side of life. Scrumptious cupcake design can become a reality of your everyday life or a playful decoration you can take out on special occasions. 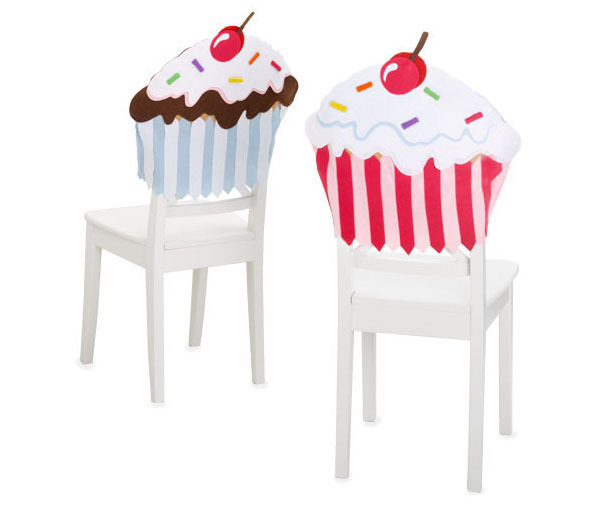 These felt chair covers would look amazing in a home preparing for a children’s party – imagine little curly heads contrasting the cherry-top cupcake backrest while enjoying the meal and then running off to play in the garden. Covered in cupcakes – a dream to be enjoyed every night! Fluffy and colorful, the travel size Baby Girl Minky Stroller Blanket is perfect for stroller or car seat rides or even as a play mat. Put it on the floor and watch your children play on the delicious colors and patterns. The comfy handmade baby blanket measures approximately 21″ x 34″ and is machine washable – perfectly sized and easy to maintain. 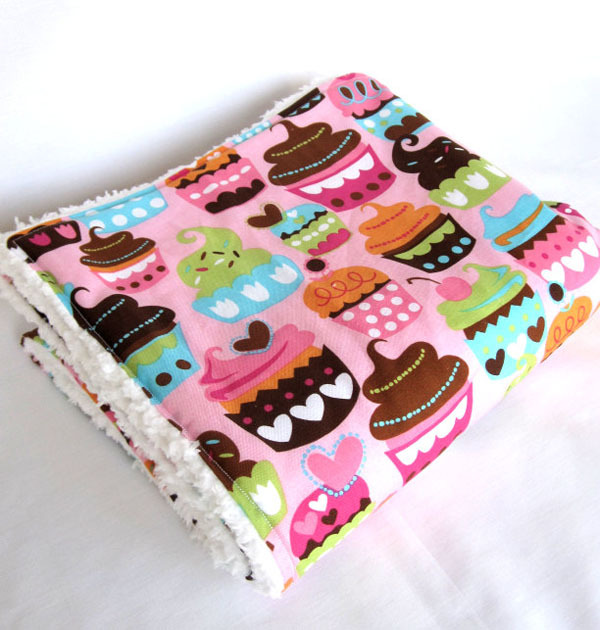 It has a pink background adorned with stylized cupcakes on one side – the fabric is “Sweet Treats Pink Cupcakes” by Michael Miller – and a soft, diamond textured backing. 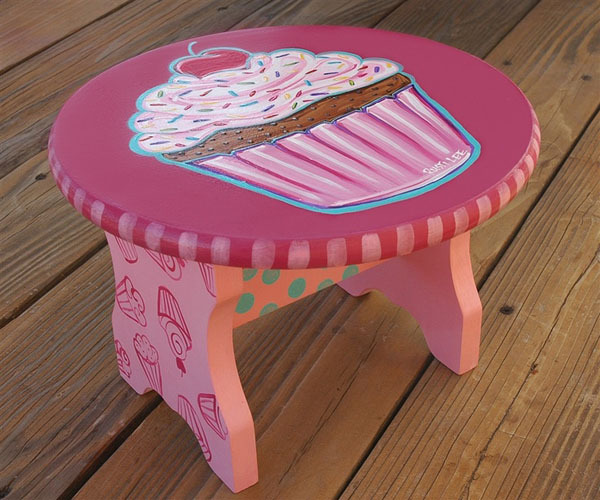 Little girls would love this cute pink cupcake stool – and it would also become a focal point in any girl’s bedroom. 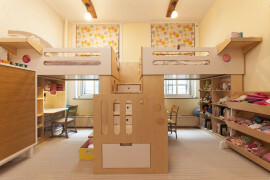 Match it with a white desk and your little princess will be coloring surrounded by a fairy-tale inspired atmosphere. 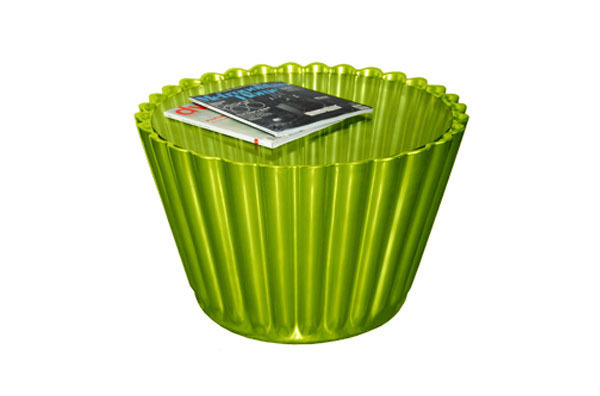 Teaching kids to appreciate handmade designs, as well as the importance of enjoying a cupcake now and again as part of a healthy lifestyle that will come natural with such a pretty reminder — like this cupcake stool, of course. 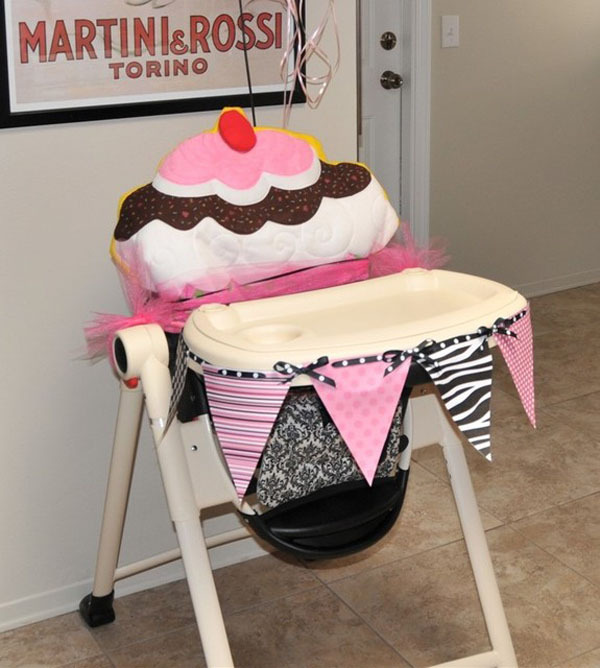 A cupcake highchair is the perfect decor for a party – revolving around this theme, cupcakes in different shapes, sizes and colors can become part of your child’s next birthday celebration. Sweet cupcakes take your mind off daily worries, so why not enjoy their visual appeal as much as their smell, texture and taste? The wall is the perfect place to display cheerful cupcake silhouettes. 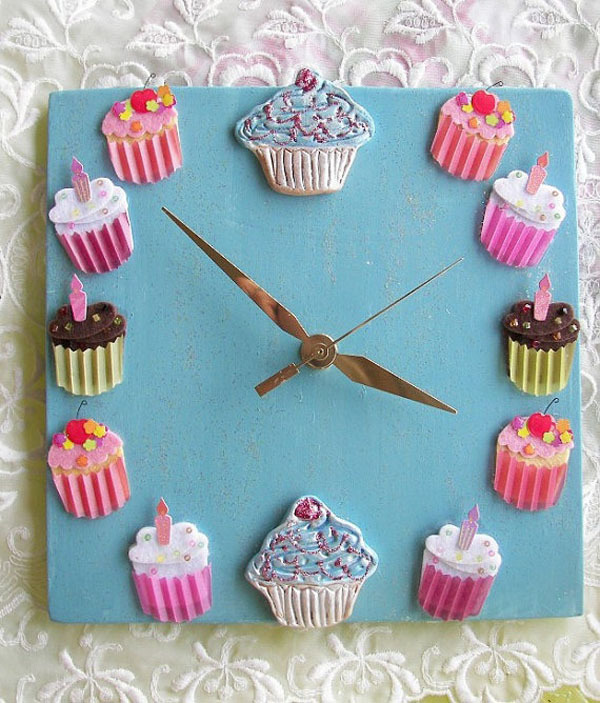 Whether you choose a cupcake mural in the kitchen, cupcake wall art for the pantry or a cupcake wall clock like the one below, you will be reminded to enjoy the little things in life. And since there are rarely good reasons to refuse a great cupcake, no one can stop you from enjoying the cuteness, kindness and happiness behind each colorful cupcake representation. There are things in life we don’t need, yet we want them the minute we lay eyes on them. This is what happened with me and the sparkly cupcake knob you can see in the picture below – it was instant love. This hand painted, engraved wooden furniture knob would look lovely on my kitchen furniture drawers. 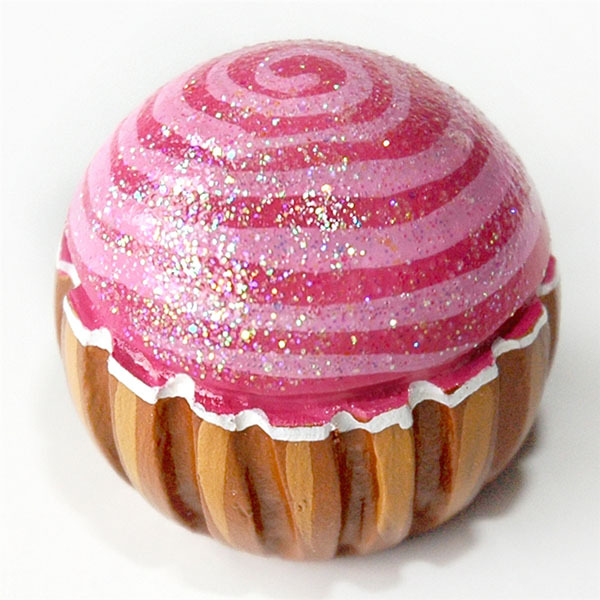 The 1 inch round pink and glitter twirly top over those engraved bottom lines come close to the shape of cupcake but holds back enough to still display the classic rounded knob shape. What do cupcakes remind you of?